The Paschim Somanath temple lies in the, western corner of Subarnapur town. Lord Somanath was worshipped in a funeral ground, situated in the western corner of the town. He was the presiding deity of the powerful Somavamsis of South Koshala and Odisha. The Paschim Somanath temple was constructed by king Prataprudra Deva. It has Mukhasala, Vimana, Brisabha mandap, Chandan mandap. Homa mandap etc. Inside the compound of the temple a south-faced Hanuman and a Bhairava facing to the west are found. 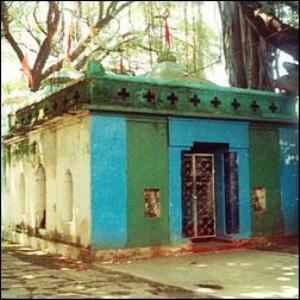 Brisabha is worshipped here by the Saivites before the worship of Siva. In this temple Goddess Parvati in the north, Lord Ganesh in the south and Lord Kartik in the west are worshipped as Parsvadevatas.